The two parochial schools in Breese, St. Dominic's and St. Augustine's, have merged to create an enhanced learning environment for Breese students known as All Saints Academy. Recently the parochial school from St. Anthony's in Beckemeyer consolidated with All Saints giving the new school a rich history. High school students are well trained, academically and vocationally, at Central High School, which also covers Aviston, Albers, Bartelso, Beckemeyer, Germantown, St. Rose and surrounding rural areas. 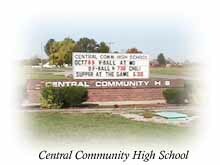 Excellent computers, a health occupations program, expanded shop classes, an outstanding business department and a new tech prep program to give students practical experience prior to graduation are trademarks of Central. Many extra-curricular activities, including sports and music, are offered. 25 minutes to Kaskaskia College, a 2-year community college. 30 minutes to Greenville College, Greenville, IL, a 4-year liberal arts college. 45 minutes to St. Louis University, St Louis MO. 45 minutes to Southern Illinois University, Edwardsville, IL. There is a fine opportunity for a well-rounded education.